There were so many things that needed attention in that room. The flooring. The vanity. The lighting. The walls. The hardware. Where to begin? Normally, I work top to bottom. 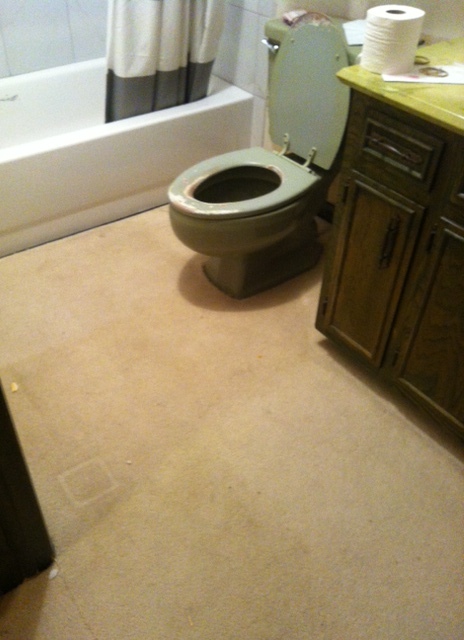 However, since I’m living in this house while remodeling, the 40 year old bathroom carpet was getting on my last nerve. So I opted with the flooring first. Like I’ve mentioned before, I buy almost all of my tile from a discount warehouse not far from my house. 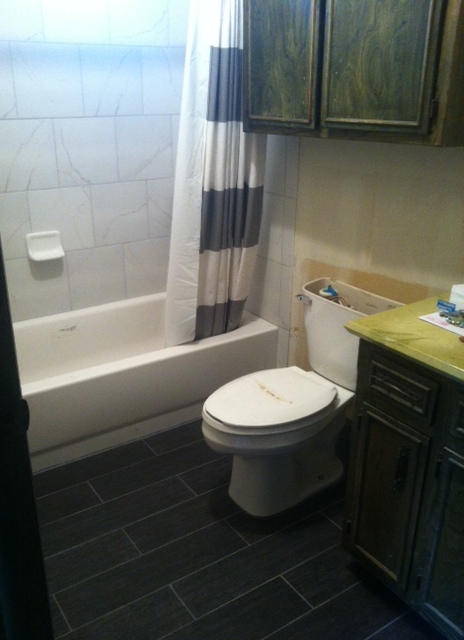 All of the tile for the bathroom cost under $40. 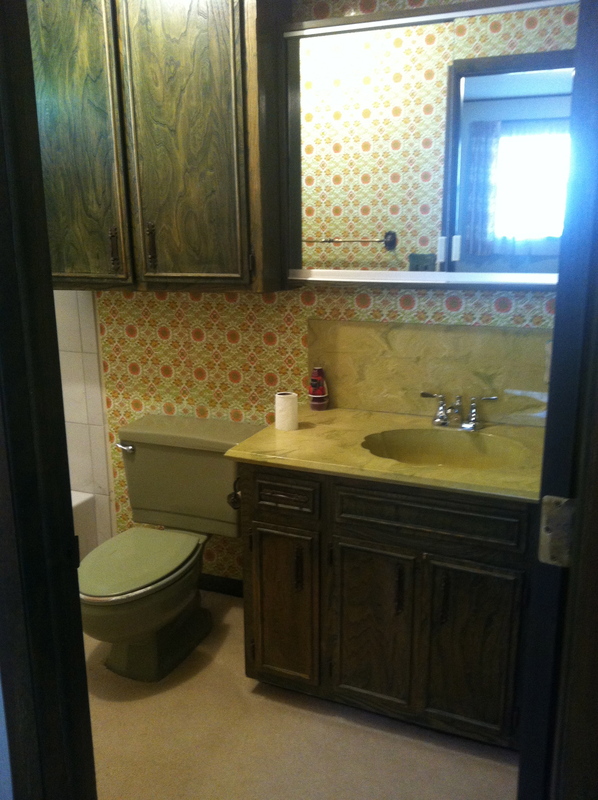 In addition to the tile, the retro green toilet had to go. I bought a toilet from another home remodel project for $3 (replaced some parts and lid though). I could have opted for typical square tile and even done a creative pattern; however, the new plank tile has really caught my love and adoration. I found charcoal plank tile and instantly fell in love. It was modern. It was unique. And it was sleek. While it is slightly risky because it’s so modern and not the typical “beige overhaul” in a flip, I like to add some unique elements. I have the world’s BEST floor guy (I normally do the flooring myself or have my dad do it, but time just hasn’t allowed that on this flip) and he does amazing work. Two of the times he has come to do a project and says “Jen, I’m not sure this will look good.” I always reply “Do it anyway!” And both times, he has finished by saying, “I was wrong. You’ve got a good eye.” After he completed the brick pattern with the plank tile, I knew my eye was right on for this project! 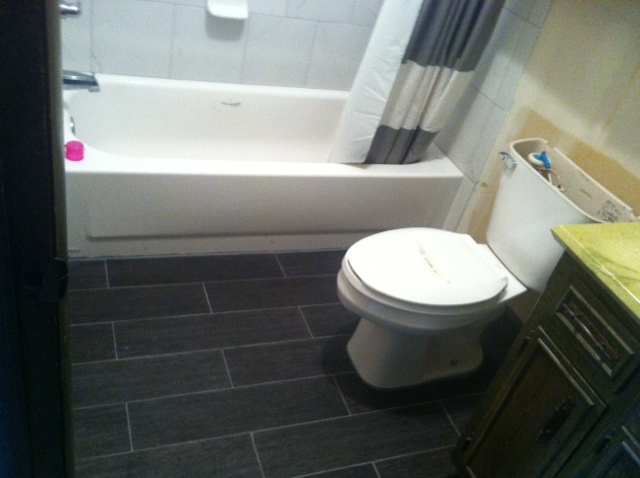 Normally with tile, if it’s a dark tile, it’s best to use a light grout. If it’s a light tile, it’s best to use a dark grout. 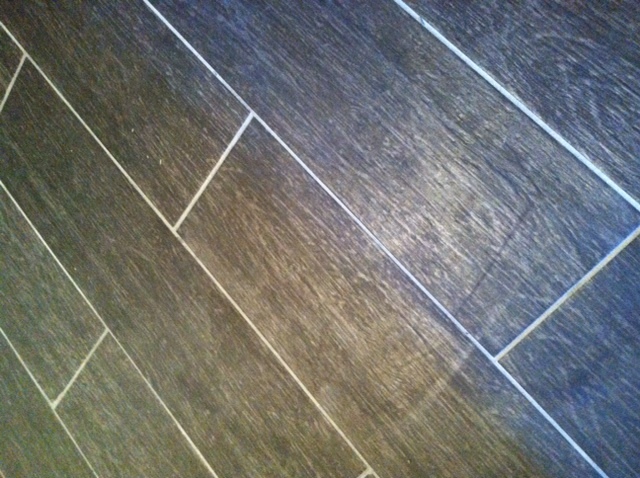 With plank tile you want it to look like wood floors, so the grout lines have to be extremely small and close in color. 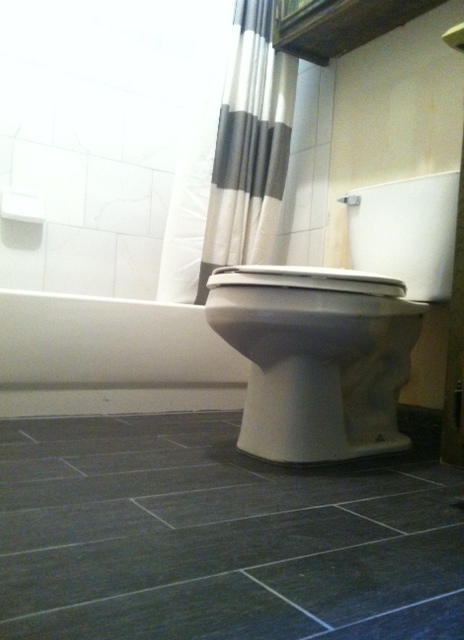 I chose a medium shade gray grout, and I was very happy with the result. 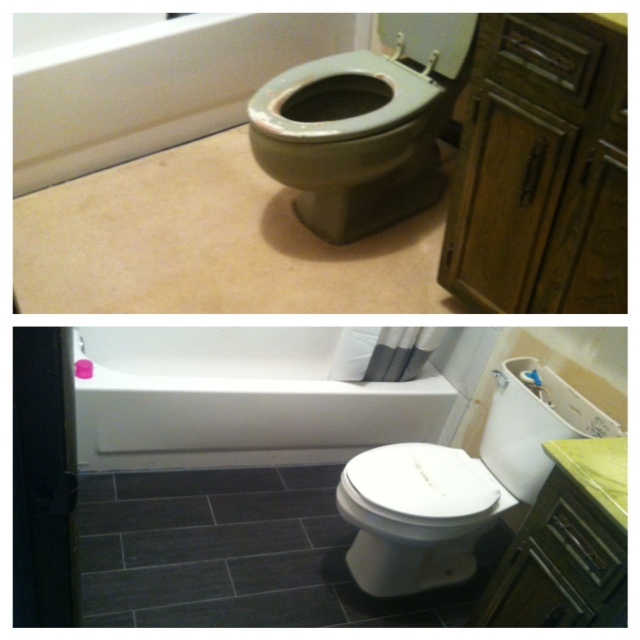 The floor guy did a great job, and he replaced the toilet for me. 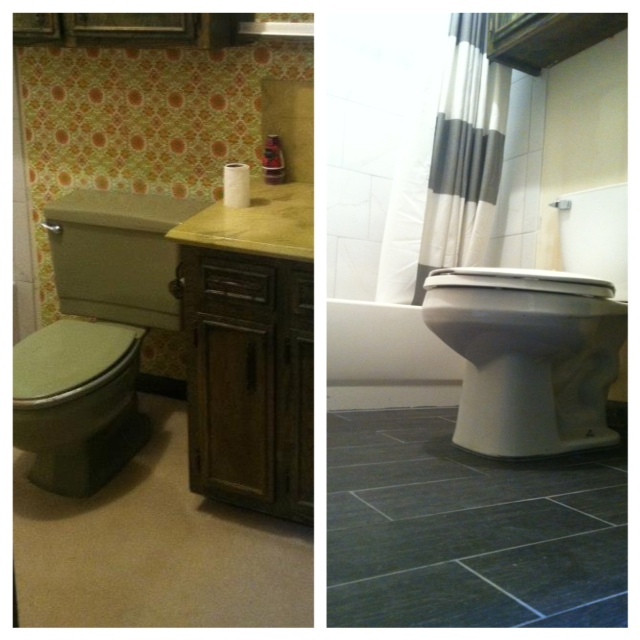 The stark contrast of the white tub and the white toilet look phenomenal to me. I plan to use light colors for everything else in the bathroom to keep the room light and airy. There is only one small sliver of a window, so I need to replicate an airy room that would be created by large windows. I am in love! I don’t think it could have turned out any better. It’s exactly what I had envisioned for that room. Up next: a DIY vanity project!